"I am using Outlook 2007, but we can't receive any emails. The pst file is almost 3GB so I have made another one and am trying to clear old stuff from the old one to the new to free up space. However, it won't let me delete or remove any emails from the old pst because it's password protected, but no one knows what the password is (could have been set by an old employee years ago). Is there a way of recovering the password of the old pst so I can start clearing stuff? " Forgot Outlook PST file password? Are you prompted for a password to open the PST file when moving over your PST file to a new system? If you have important business data or software license key in the Outlook emails but forgot your PST password, you're screwed. Fortunately, there is an easy way to recover Outlook PST password. 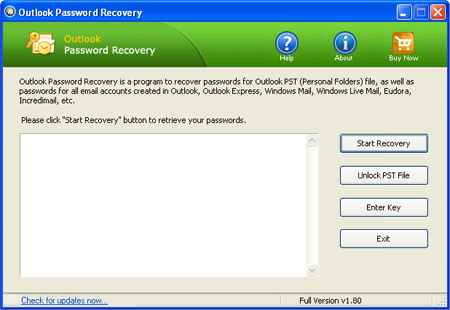 With Outlook Password Recovery software you can recover Outlook PST password quickly. Run Outlook Password Recovery, then click the Unlock PST File button. The File Open dialog will appear. Choose your password-protected Outlook .pst file, then click Open. The program will start to decrypt the PST file and provide 3 different passwords. You can then use any of them to unlock and open your password-protected PST file. Please note: the recovered passwords may differ from your original password, but you can also use them to open your Outlook PST file. That's due to Outlook encryption algorithm. Outlook Password Recovery is the most efficient Outlook PST password recovery software which not only recovers Outlook PST password but also retrieves email account passwords in MS Outlook and Outlook Express.